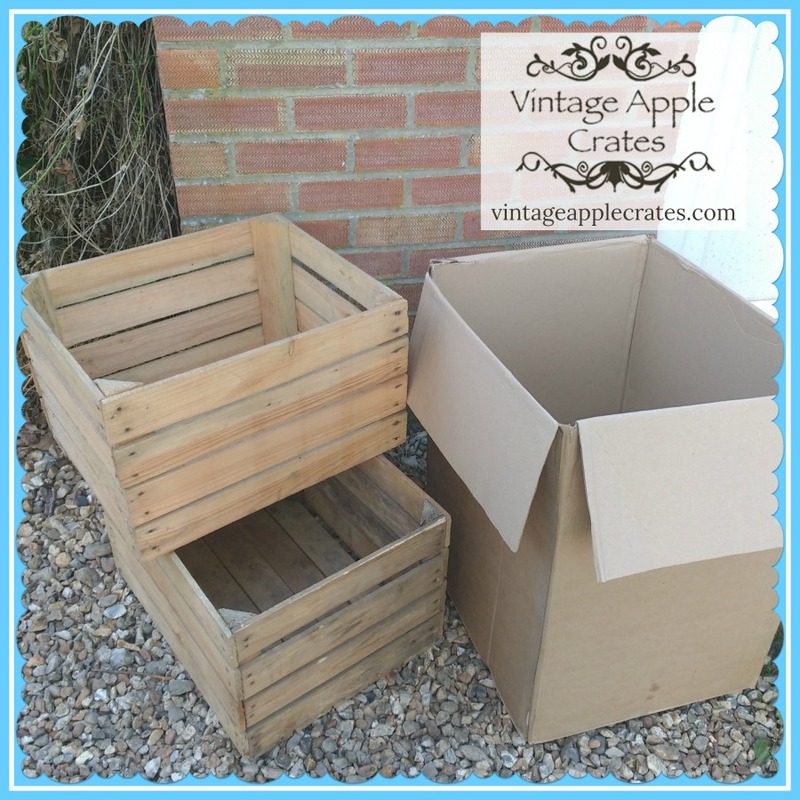 Review Of Beautiful Vintage Apple Crates From vintageapplecrates.com. Perfect For Adding Some Rustic Charm To Your Wedding Decor! My sister got married in April and the lovely Michelle over at vintageapplecrates.com was really kind and gifted us 2 of her vintage apple crates to use as part of the wedding decor at the venue. Thank you so much Michelle! The crates cost £15.50 each and there is a minimum order quantity of 2. “These sturdy wooden apples crates are our most popular type and have many uses. 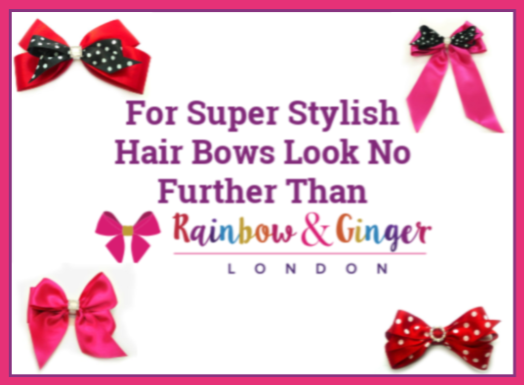 They are perfect for storage around the house – they can be stacked for use as bookshelves or display cabinets or used as toy boxes, shoe storage etc. As these are genuinely used crates colours will vary within each order – we are unable to accept requests for lighter or darker crates, however, we will always do our best to ensure that all the crates in your order are as similar in colour to each other as possible. My sister was so happy when I told her that Michelle was gifting her two of the apple crates to use as part of her wedding venue decoration. She has always loved the rustic look of the apple crates but hadn’t yet got round to ordering or hiring apple crates for her wedding. By chance I had been seeing Vintage Apple Crates tweets (twitter.com/VintageCrates1) in my timeline and on the off chance I tweeted them to ask if they would consider collaborating on a review and I was delighted when they said yes. As I mentioned earlier, the crates arrived really promptly and they came simply packaged in a cardboard box. There was no dreadful plastic wrapping or bubble wrap to be sent to landfill….just the crates…in a box… which was lovely and made such a change. The day the crates arrived I needed to take some photos of some items I had purchased from oldenglishprints.com (using a gift voucher they had sent me in return for writing about a competition) and the crates looked like the ideal way to display my items for the shot. I set down an upturned crate near some daffodils in my parent’s garden and arranged my items on top. It made for the perfect picture! 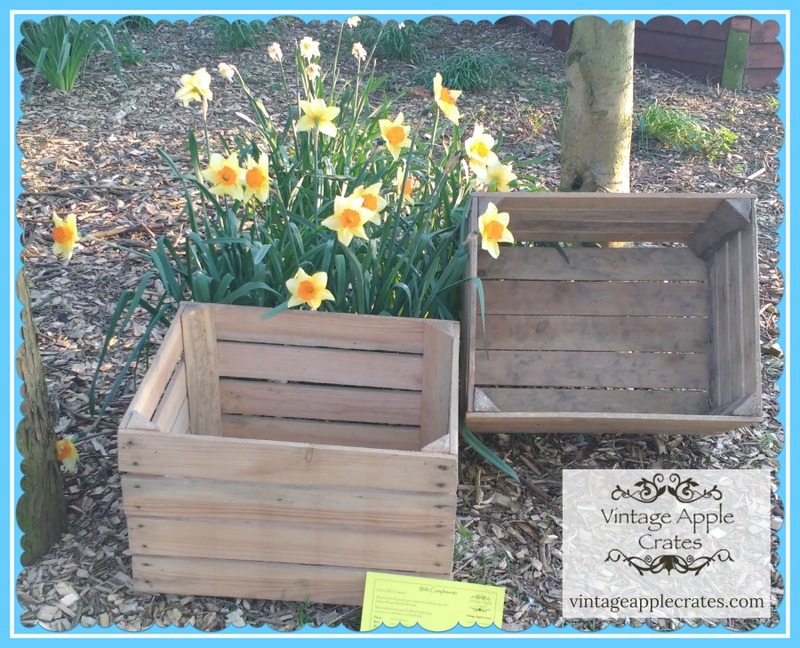 I also took a lovely photo of the crates on their own near the daffodils so I could show you all how pretty they are! Please note that they are not all super smooth and spotlessly clean…they are what they are….apple crates that have been used on fruit farms and then sold on to the consumer to be used for many imaginative uses! (storage, seating, wedding decor, garden planters etc) The rustic, shabby chic look means they are bang on trend to be used as part of a wedding decor! 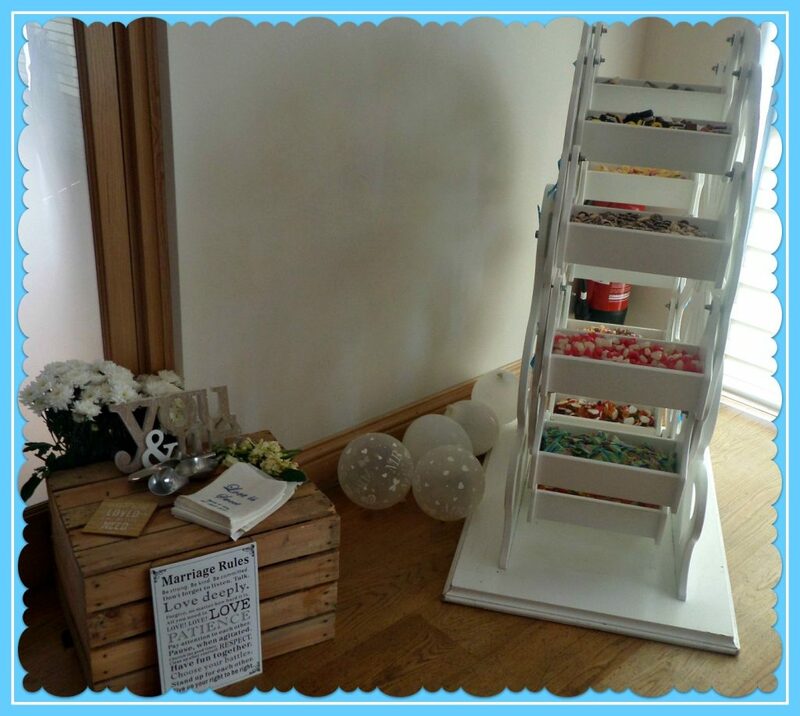 🙂 You could upturn them and use them to display the wedding cake on, you can use them as a place for people to put your wedding gifts, you could fill them with bottles of wine…there are so many things you can do with them! 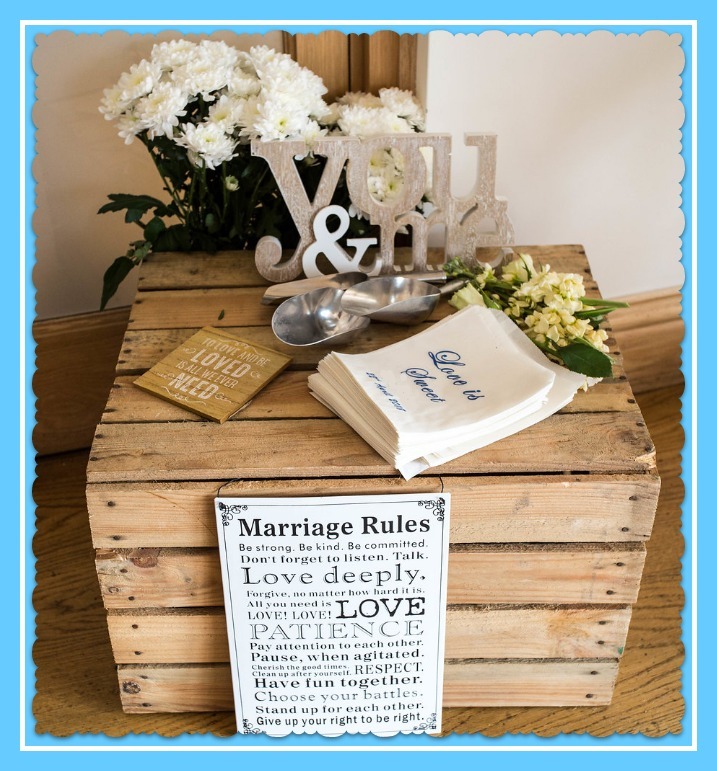 Have a read of the blog post ‘How to use a wooden crate at your vintage wedding‘ to get some ideas. 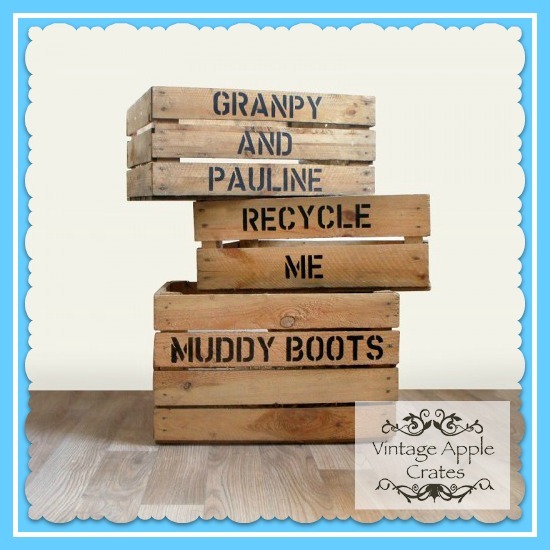 There are a few different types of apple crate available to purchase over on the vintage apple crates website. View them all here >> www.vintageapplecrates.com. The ones I received were Type 4. Take a look at the article ‘Which crate is for me?‘ to decide which ones to go for. 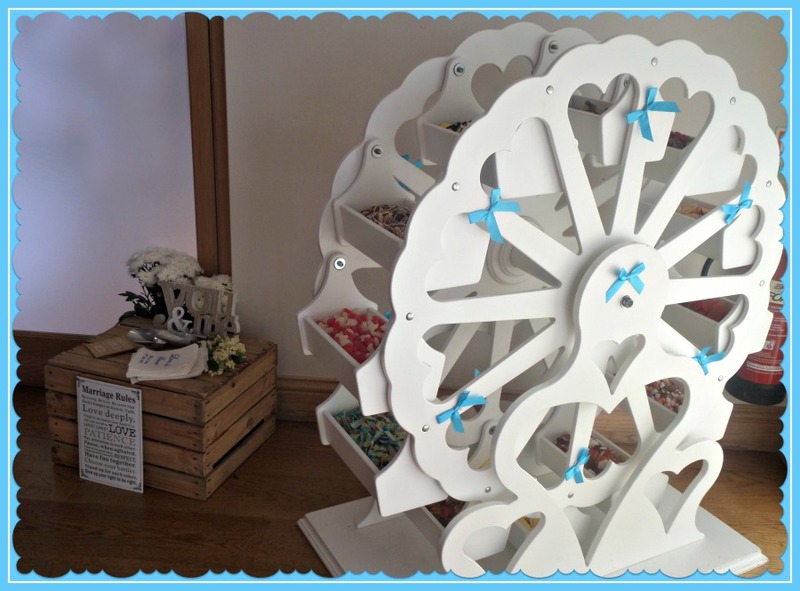 So now I shall get to the wedding!……..
My sister used one of the upturned apple crates as a mini table next to the large sweet ferris wheel and on top of it she placed the sweet scoops, the personalised sweet bags and a selection of decorative ‘wedding’ themed signs. She placed a bunch of white flowers behind it and the whole display looked amazing! The other crate was used the right way up in the wedding reception room and it was filled with a selection of shawls and flip-flops for the guests to use if they got tired feet or felt cold during the evening. I took some photos of the upturned crate next to the sweet wheel but for the life of me I cannot find the photo of the other apple crate with the flip flops and shawls in :(. (I am so sorry Michelle) I promise you all that it also looked stunning (even though I have no photos) and people really appreciated my sister’s offer of flip flops so they could take their heels off after a long day! These crates retail at £15.50 each (minimum order of 2) and they come with free UK delivery. Such a small price to pay for MAXIMUM Impact! 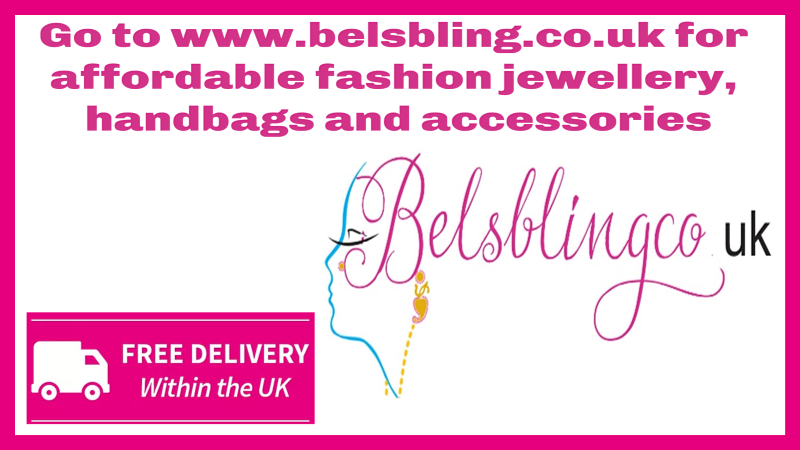 (Free delivery is an option for most of the UK, however, surcharges may apply in the following areas which are generally highlands/islands: BT, FK17-19, G83, GY, HS, IV, IM, JE, KA,27-28, KW, PA20+, PH15+, PO30+, TR21+, ZE1-3 ). For an additional charge of £5.00 you can have the crate sanded and if you want to have handles on the crate you can pay £5.00 and either have hole handles or rope handles added. 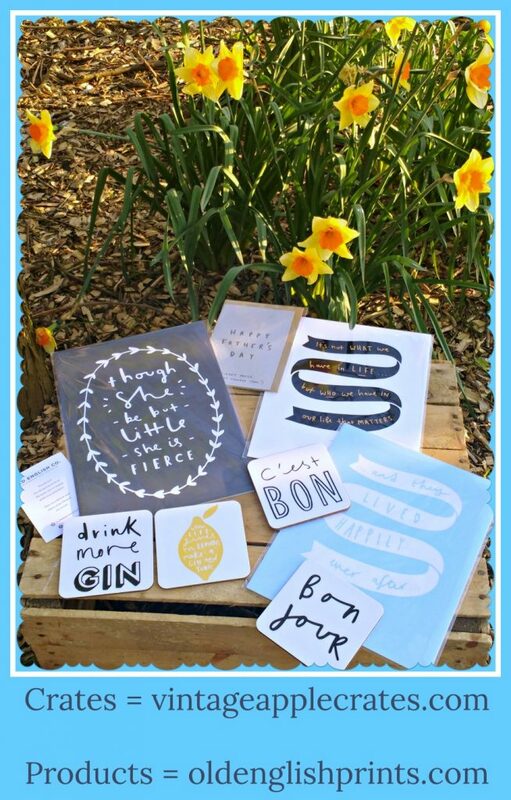 If you would prefer a personalised apple crate rather than a plain one there is also the option to order that on their website. It is £29.99 for an un-sanded personalised crate with additional fees to pay if you want it sanded or handles added. 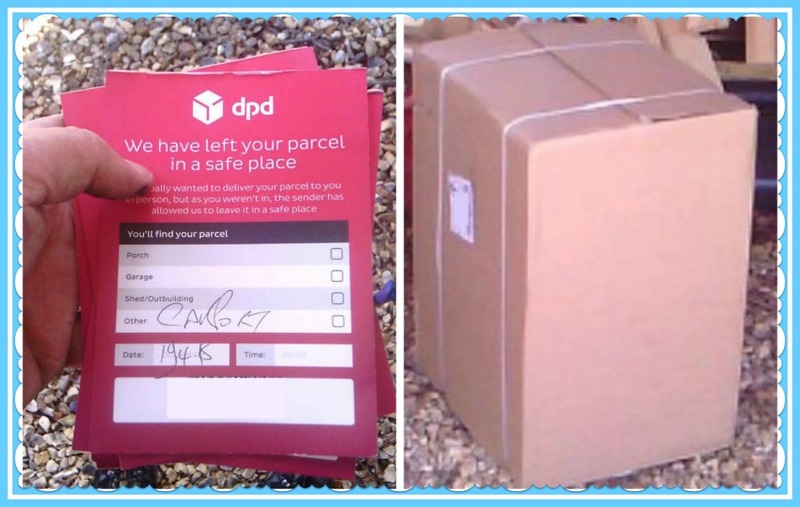 The photo below shows an example of a personalised crate. You could maybe order one to put your wedding gifts in and you could have ‘Wedding Gifts’ stenciled on to it or perhaps you could have ‘Mr & Mrs Smith’ (as an example) stenciled onto it and then you could stand your wedding cake on top of the upturned crate. I cannot fault vintageapplecrates.com in the slightest. The customer service was fantastic, the delivery was prompt and the rustic apple crates were exactly what they should be…rustic! 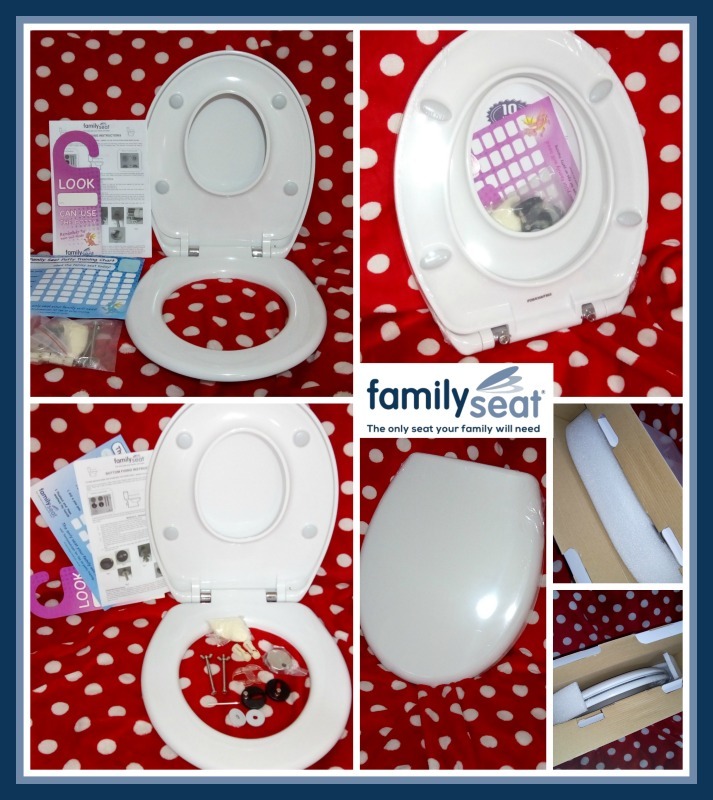 I highly recommend this company to you and I know that if you choose to order from them that you will love dealing with Michelle as she makes the whole process so simple. I would like to say a BIG thank you to the company for being so kind and gifting the 2 crates to us for my sister’s wedding. This entry was posted in Review on May 20, 2018 by admin.